More often than not when an offense gets into a tight bunch set to both sides of the formation you can bet you’re about to get crossing routes. Defenses work on this a lot to prevent picks and rubs as the receivers cross the middle of the field. So much in fact that it often sets up an opportunity to do something other than run a crossing routes concept. 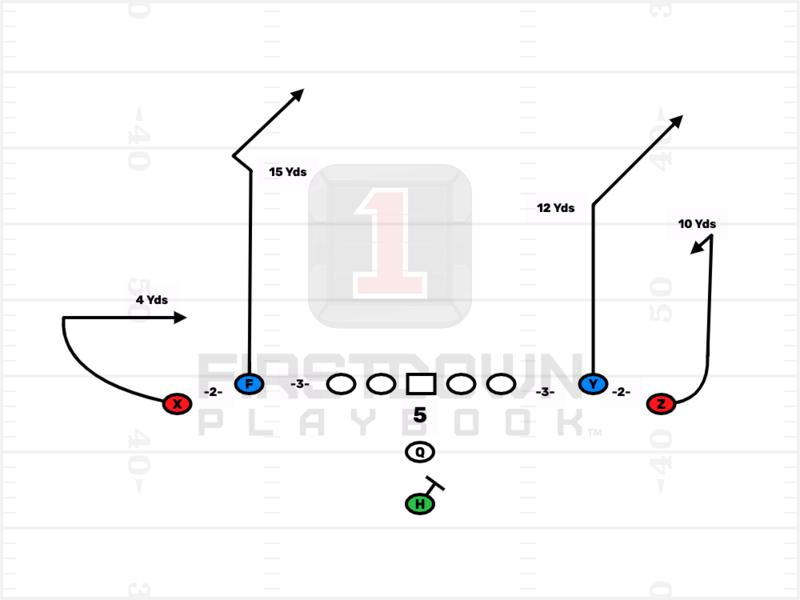 Today we wanted to feature this FirstDown PlayBook DropBack pass play in our Varsity Offense section to show you an example of how not all pass plays with tight receiver splits have to be of the crossing variety. This play shows an example of how you can get creative and set up a high low to one side with a “Follow’ or “Levels” concept to the other. The other thing we want to point out is that FirstDown Playbook member coaches have access to thousands of pass plays drawn up just like this one. Each and every one has suggested quarterback reads and coaching points as well. 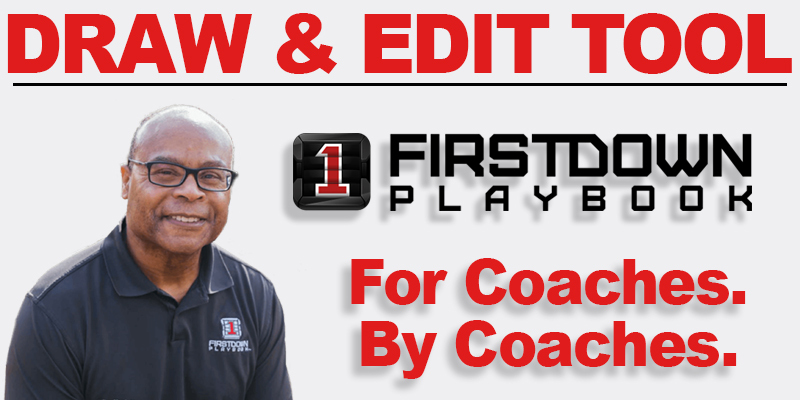 Of course, the icing on the cake is that now our FirstDown PlayBook coaches can edit all of these plays for their very own custom playbook. -HARD OUTSIDE RELEASE AND SELL THE THREAT OF A VERTICAL ROUTE. -FORCE THE DEFENDER TO WIDEN TO DEFEND YOU. -AT FOUR YARDS PLANT THE OUTSIDE FOOT AND BURST BACK INSIDE. -STAY ON THE MOVE AND TRAVEL WITH TEMPO AS YOU COME BACK INSIDE. -BEST RELEASE TO THREATEN THE DEFENSE VERTICALLY. -KEEP THE WIDTH OF THE ROUTE UNTIL AROUND 15 YARDS. -AT 15 YARDS NOD OUTSIDE AND THEN BREAK INSIDE TO THE NEAR UPRIGHT. -KEEP THE ROUTE THIN & AWAY FROM THE FAR SAFETY AND INSIDE OF THE NEAR SAFETY. -BEST RELEASE AND SELL VERTICAL FIRST. -BREAK TO THE CORNER AT 12 YARDS. -KEEP THE ROUTE HIGH TO AFFECT THE SAFETY. -OUTSIDE RELEASE FOR WIDTH AND VERTICAL THREAT. -STRAIGHTEN THE STEM AND PUSH DOWN FIELD TO SELL THE DEEP BALL..
-AT 10 YARDS DEPTH PLANT THE OUTSIDE FOOT AND WORK BACK TO THE QB. -EXPECT THE BALL JUST AS YOU TURN BACK TO QB.